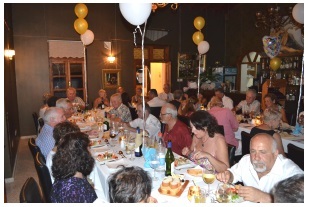 Golden Wedding anniversary in North Cyprus at The Corner House in Ozanköy. Harry and Jean have lived in Doğankoy in North Cyprus for almost 7 years and have made many friends here. 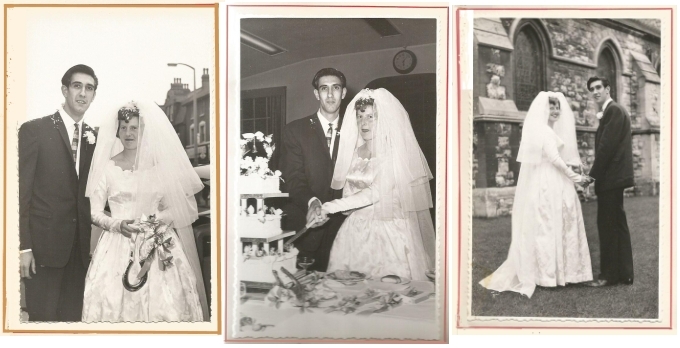 There were 31 friends, Cypriot and British, who had been invited to help Harry and Jean celebrate their special anniversary. We arrived at the Corner House to find most of the party congregating on the terrace with a welcome drink and canapés and it was lovely to meet up with so many familiar faces and to also meet some new people. had already been asked to make a choice from an excellent menu and the staff at the Corner House worked so hard serving us all with our various choices. After 3 courses I think everyone was rather full and there was more to come – the cake. 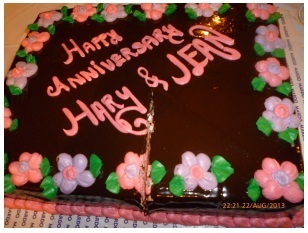 Harry and Jean did the traditional cutting of the cake and then it was taken away to be cut and served to the guests. Harry made a “quick” speech – “thank you for coming” and sat down, to much laughter, but he then got up again and thanked everyone for coming and said a few words to his and Jean’s friends. Then came the cake and coffee and brandy – my goodness I could hardly move!! During the evening some people wandered out onto the terrace for a cigarette or a breath of fresh air so it was nice to be able to talk to some of the guests we hadn’t met before and catch up with some that we did know but hadn’t seen in quite a long time. Gradually the guests started to leave to make their way home and we thanked Harry and Jean for inviting us to their very special occasion. We later asked if Harry and Jean had a special song from their wedding year in 1963 and although they didn’t come up with anything from that year, Harry remembered some from 1957 when he did his National Service and every time he went into the NAAFI there were 3 songs always playing – Pat Boone singing Love Letters in the Sand, Paul Anka singing Diana and Elvis Presley singing Teddy Bear, so we are including one of these, a youtube clip of Elvis Presley singing Teddy Bear. You might like to view the photos in the following slideshow and then look at Elvis in the video.